As David Kohrman points out, the c.1917 Madison Theater signified a lot of firsts. It was the first of the large, "grand palace" theaters built in Detroit specifically for screening the new "moving pictures," and it was the first theater built on what would become the Grand Circus Park theater district. Prior to the Madison, most of Detroit's movie houses were smaller, and were mostly clustered along Monroe Street, the last remaining of which was the National Theater. The Madison was also the first theater to be built by the partnership of John Kunsky and C. Howard Crane, who throughout the early 20th century would design many more ever-increasing-in-size movie palaces. In the immediate area, these would include the Adams, Oriental, Capitol, Wilson, State, Fox, and United Artists' Theater. Kunsky was credited with opening the first commercial movie theater in Michigan, the Casino Theater, on Monroe Street in 1905. According to Michael Hauser and Marianne Weldon's book, Detroit's Downtown Movie Palaces, the first movie screened at the Madison was Poor Little Rich Girl, starring Mary Pickford. The Madison featured rich velour curtains and draperies designed and installed by the Newcomb-Endicott department store just down the street. The organ was a Hilgreen Lane and reputed to be the largest theatrical instrument in existence outside of New York City. Hauser and Weldon also note another Madison "first"...the first full-length talking picture screened in Michigan was seen here on Christmas Day of 1927: The Jazz Singer. In 1960s the Madison had a record-breaking 68-week run of The Sound of Music. 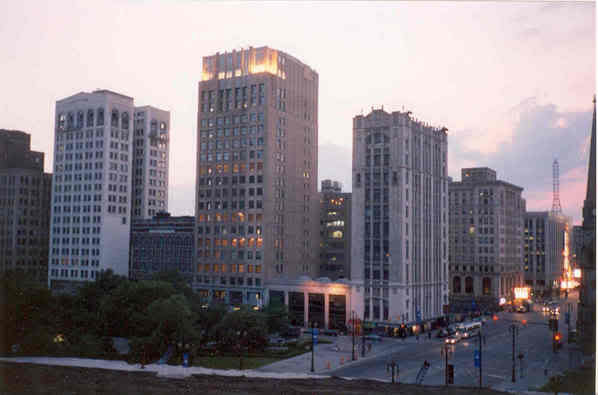 Not only that, but Mr. Kohman also notes that the Madison also served as the start of another Detroit tradition, the marrying of every major theater with an office tower built over it. This was of course done in order to give the property another viable revenue stream just in case the "moving picture" was just a passing fad. Ironically it turned out to be the other way around, and the concept of office space in Detroit was the passing fad. 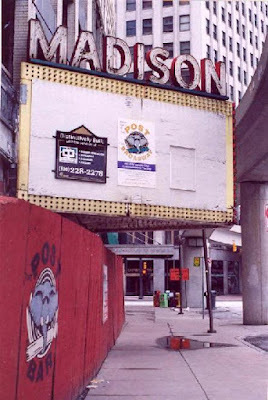 By 1984 the Madison would close permanently, joining the rest of the Grand Circus Park area in becoming the "Dead Zone"...a nickname acquired by the fact that the Madison's marquis still ominously displayed the title of the last movie it showed, which even more ironically was a Steven King movie called The Dead Zone. A decade or so later, the area would become known as the "Skyscraper Graveyard," thanks in part to Jose Camilo Vergara. In the year 2000 the Michigan Opera Theater started a renovation on the building but their financing failed. 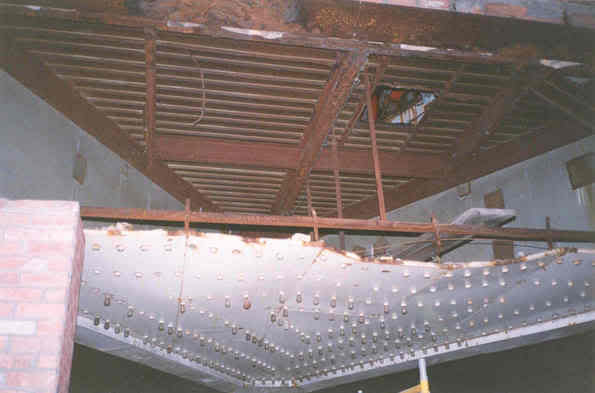 It was sold to a developer planning loft apartments, and despite the historic significance of the Madison Theater, demolition began on the beautiful auditorium. This loft development plan also petered-out by that summer, so the Madison's auditorium was essentially razed for no reason. And back in those days, since it was still the case that no one was paying attention or cared about Detroit yet ("Entrepreneur Guy" had not yet made it cool, I suppose), no cry for preservation was raised on behalf of the theater. Happily, David Kohrman managed to sneak in before demolition and get some PHOTOS of it. Another silver lining is that the huge decorative plaster frieze of dancing maidens that used to be above the Madison's proscenium arch was salvaged and was reinstalled in the Eureka Lofts on Broadway where it can still be seen today, according to Hauser and Weldon. Today the remaining five-story office tower portion of the Madison Theater has been reopened with a restaurant and offices, but the main thing that I remember the Madison for was the fact that it served as the way into the Broderick Tower next-door. 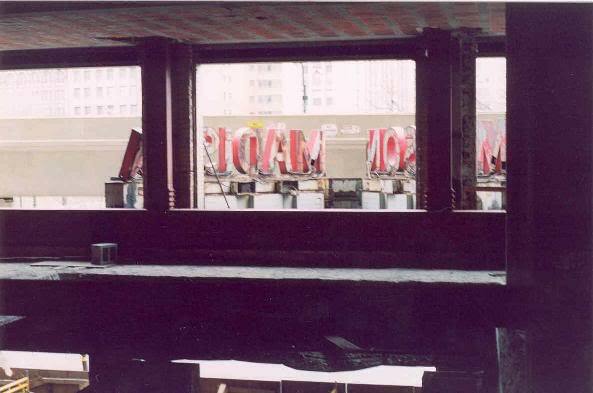 Anyone who was out and about in those days remembers fondly a couple things about the Madison--the tight crawl under the new roof, the balance-beam act to skirt around the hole in the roof, and the climb and tight-fit through the tiny hole in the wall to get into the coveted Broderick Tower. It was several years before the method of entrance to the Broderick would change or become any easier. 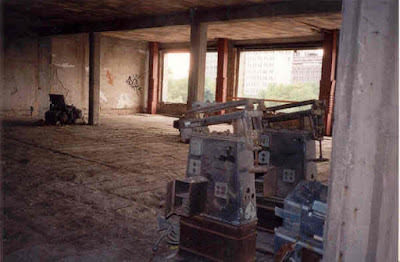 As a result of the interior being mostly stripped to bare concrete, we never really hung out at the Madison, nor did we ever go there expressly to see that building, it was always merely a step-stool to reach the cookie jar high up on the shelf. I thought I had at least one photo of the Madison's old bannister that had been preserved, but I don't see it anywhere.